The construction phase for Stage 1 of TMAG’s redevelopment is now underway, with VOS Construction and Joinery (VOS) starting the main works on Monday, 21 November 2011. Stage 1 is focused on TMAG’s heritage buildings and Courtyard area, and will make these spaces more accessible to visitors while retaining the original features and ambiance of these nationally important buildings. The construction works will be taking place in and around the most significant and diverse collection of heritage buildings in the nation, and these buildings are as important as the objects and exhibitions they will contain when they reopen to the public. Exhibitions, public programs, and opportunities for life-long learning connect TMAG with all areas of our community, and Stage 1 will make the museum a more inspiring place to visit. A suite of new exhibitions will inspire children and adults alike, mobile activity carts with Art and Museum themes will be introduced and there will be a dedicated program for early childhood visitors. This approach will provide new and exciting opportunities for young visitors by allowing families and children to engage, and interact with exhibitions and displays together, throughout the museum and art galleries. Stage 1 will deliver much-needed upgrades to existing galleries and public spaces, create additional exhibition spaces by making available areas that are not currently open to the public, and provide improved visitor access and facilities. This is a tangible step towards realising the vision of a completely redeveloped TMAG. 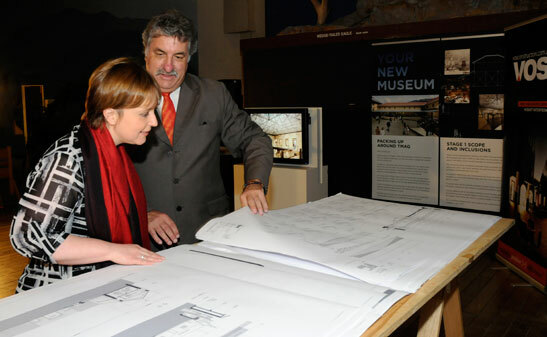 The completed heritage works and the suite of new exhibitions and programs, which are currently in development, will be revealed when the whole of TMAG is reopened at the beginning of 2013.